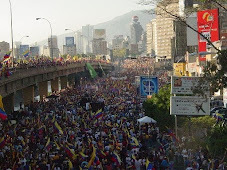 Venezuela News And Views: Chavez tries to backtrack on his "drop dead!" to Venezuelans living in opposition managed areas. Chavez tries to backtrack on his "drop dead!" to Venezuelans living in opposition managed areas. I am sorry for this not very eloquent or fancy title. I was letting you last Friday that Chavez had revealed himself his hatred of whatever he does not understand, does not agree with him, etc, etc... hallmarks of course of people with overall little education (they call them fascists too as curiously commie leaders tend to be a tad more educated, or at least well read like Fidel). He simply said, but with anger, that he could not approve of health care funds for hospitals run by not PSUV people. Of course such a despicable attitude raised a sea of criticism and 48 hours later he had to backtrack fast. I am putting the video below and not translating any part because I simply have no time and his words are actually not that important (same cliches, same cheap and unjustified attacks, accompanied with the usual defamation that woudl land him in a court of justice on the spot if there was justice in Venezuela). What is worth noticing there is his rambling speech, that he cannot hide his discomfort at having to do an apology, such apology of course coming out not convincingly at all, making the situation worse! I prefer coming back to when he said that he was not going to fund the Perez de Leon. There was a moment when his minister of health was trying to explain him something and he simply refused to listen to her and went ahead with his now infamous declaration. I have the feeling that the woman realized that he was going to make the mistake and tried to stop it, but Chavez has reached such a level of autism that he simply could not let the woman speak! Saturday in that video below he says that she is not there becasue she is ill. I sense that once Chaevz realized what he had done he went up in rage against the woman and she might be about to be fired or already quitting the government on her own. At least that is what she should do if she has any dignity. It is interesting that Hugito is suddenly worried about what Venezuelans think of him, after taking their views for granted for so many years. 1. The US sunk the South Korean destroyer that North Korea sunk. 3. Osama bin Landen was created by the CIA. For a while now I've wanted the US to reach some sort of accommodation with Cuba, at least get rid of the embargo. Castro's anti-American diatribes make that harder to want better relations with Cuba. From de Clermont - It is easier for a civilised man to behave like a savage than it is for a savage to behave like a civilised man. Perhaps now the flimsy façade that Ego has created he is beginning to tire of. Regarding the previous commentary about the embargo of Cuba, the US is correct to maintain it. The other countries should be ashamed for not participating. It worked against apartheid South Africa and everyone agreed the moral cause. Is Cuba no different - millions of slaves to serve at the whim of the Castros and their sycophants. And the press calls Castro "President"...he is Dictator, Despot or Tyrant, but not president. A president is democratically elected. What a farce and what an embarassment for the so-called democracies in the Western Hemisphere that claim to support the universal rights of man, except when it comes to "respected" socio-economic contrarians. It worked against Apartheid because the Afrikaners wanted to make business. The Castro brothers are the only ones allowed to do business in Cuba and embargo or not they manage to do what they need for their own sake. There are many differences between South Africa and Cuba. First, as Daniel says, South Africa was capitalist and wanted to do business with the rest of the world. Second, the discrimination in South Africa was based on race, and not ideology. Also, the opposition black population had a voice, with leaders known outside the country (Mandelan, Tutu and others) who clearly were supported by a large segment of the black population and even some whites. That population favored the boycott. Cuba is more complex; their policies, though repugnant, are not racist. There is no recognizable opposition, that calls for violent protests against the regime or urges a boycott.